Life can take you on interesting detours. I sat down a couple of nights ago to write the next episode of ‘Some Other Scotland‘, only to find myself some time later digging through the internet for every scrap of information I could find about the R34 – the first aircraft to make a return Atlantic crossing. Why? It all ties in with the first ‘spin-off’ story from SOS, and I was checking some facts from the past before including them in the main podcast so that I wouldn’t end up contradicting myself when I come to writing the off-shoot. It seemed like a logical course of action. What I ended up with, in conjunction with the latest prompt from Great Hites, was a short stand-alone story providing background for the main character of that story. It is, in effect, a spin-off from the spin-off. 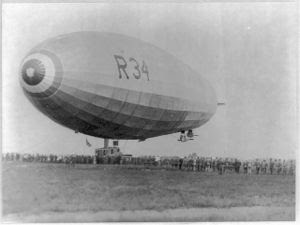 This new story tells the tale of one year in the life of a rigger on the R34 airship, which was based at East Fortune, not far from North Berwick. As it stands, there is no direct link with the podcast story, but the forthcoming special episode will tie the two together. Pay a visit to Great Hites’ latest episode to read the story or listen to me reading it, along with a number of other short tales read by their authors. Great Hites celebrates a year or podcasting short fiction this week, so drop by and show your support!